High-Frequency Chest Wall Oscillation (HFCWO) vests are the standard of care to help manage certain respiratory conditions. We performed this study to investigate the effects of the short-term application of motor and compressor-based HFCWO vests on the spirometry parameters and to assess if there were significant differences between the two device types. We conducted a prospective, three-arm study in healthy subjects for changes in TV, PEF, FVC, FEV1, and FEF25-75%. In each arm of the study, a motor-based vest (AffloVest® manufactured by International Biophysics Corp., Austin, TX n=10) and one compressor-based vest (The Vest® manufactured by Hill-Rom, St. Paul, MN, SmartVest® manufactured by Electromed, New Prague, MN and inCourage® manufactured by Respirtech, St. Paul, MN each n=10, total n=30) were evaluated. Consecutive subjects in each arm were fitted with the two different types of HFCWO vests in alternating order. Tests were performed at baseline and while using each device. There were no statistically significant differences in TV and PEF between baseline and while wearing HFCWO vests. FVC (4.12 L vs. 4.29 L, p=0.019), FEV1 (3.30 L vs. 3.51 L, p<0.005) and FEF25-75% (3.19 L/s vs. 3.71 L/s, p < 0.005) were significantly decreased in the aggregate compressor group. In the AffloVest group, FEF25-75% was significantly decreased (3.54 L/s vs. 3.71 L/s, p = 0.031). FEV1 and FEF25-75% were significantly lower in the compressor-based group than in the AffloVest group. We show for the first time that during use compressor-based HFCWO vests significantly decreased FEV1, FEF25-75%, and FVC, while only FEF25-75% was significantly decreased in the AffloVest group. The mode of action of increased cephalad airflow bias in the lungs does not appear to be supported by the standard clinical lung function spirometry parameters measured. None of the vest groups showed statistically significant increased airflow in the lungs. This does not support increased cephalad airflow bias in the lungs during use as a mode of action for HFCWO. High-Frequency Chest Wall Oscillation (HFCWO) vests are the current standard of care to help manage certain respiratory conditions and reduce the discomfort of symptoms. HFCWO devices have long been used to treat a wide array of lung diseases, including conditions such as cystic fibrosis, non-cystic fibrosis bronchiectasis, and Chronic Obstructive Pulmonary Disease (COPD), showing significant improvement in pulmonary function during the period in which individuals wore the devices1,2,3. There are currently several commercially available HFCWO vests utilizing two different technologies – one technology utilizes a pneumatic compressor connected to an inflatable garment and the other utilizes mechanical oscillators integrated into a wearable garment. However, to date there is limited clinical evidence to demonstrate the mode of action for these devices. One proposed mode of action is cephalad airflow bias4 however; this mechanism is not well elucidated based on existing clinical measurement methods. The methods used to measure cephalad airflow bias are indirect measurements of airflow which are taken at the subject's mouth and have not been correlated to any effects in the lungs. There is also a lack of clinical evidence in the literature via controlled human studies to support this mechanism. Another proposed mode of action is that the physical vibration of the chest wall helps to loosen secretions via a physical vibratory/oscillatory action, similar to the action of manual Chest Physiotherapy Treatment (CPT)5. We performed this study to investigate the effects of the short-term application of mechanical oscillator and compressor-based HFCWO vests on the spirometry parameters Tidal Volume (TV), Peak Expiratory Flow (PEF), Forced Vital Capacity (FVC), Forced Expiratory Volume (FEV1) and Forced Expiratory Flow (FEF25%-75%). Another aim of the study was to determine if there were any significant differences in these parameters between the two device types. This was a prospective, single-center three-arm study in healthy subjects completed under Institutional Review Board approval. Each enrolled subject served as their own control with baseline spirometry measurements performed at three intervals; initial, middle and final. Any subject that withdrew prior to the completion of the study was omitted from the final analysis; said subjects were replaced with another subject to ensure a full sample size was obtained. All healthy individuals between the ages 18 and 50 were eligible for study enrollment. Subjects were screened by the investigator according to the protocol to ensure that they met the inclusion criteria. Table 1 summarizes the participants' demographics. The study was constructed into three arms — in each arm, consisting of 10 subjects, both the mechanical oscillator-based vest, as well as one of the three compressor-based vests were evaluated. Each of the three compressor vests was tested by 10 of the 30 total subjects, and each one of the 30 was also tested with the mechanical oscillator-based device. The order of device testing alternated between the mechanical oscillator-based and the respective compressor-based vest within each group of subjects. The HFCWO vests used were the AffloVest® mechanical oscillator-based device (manufactured by International Biophysics, Austin, TX), and three compressor-based devices: The Vest® (manufactured by Hill-Rom, St. Paul, MN), SmartVest® (manufactured by Electromed, New Prague, MN) and inCourage® (manufactured by Respirtech, St. Paul, MN). After enrollment, each subject was fitted with both an AffloVest product and a compressor-based type vest. An initial spirometry baseline was taken using standard spirometry equipment (MIR Spirolab®) and using standard spirometry procedures, according to American Thoracic Society (ATS) guidelines6 for TV, PEF, FVC, FEV1 and FEF25-75% without any device on the subject. Subjects were assigned a HFCWO vest order depending on enrollment number, with the type of HFCWO vest in alternating order between subjects. An initial spirometry baseline was taken using the standard spirometry equipment and procedures, without any HFCWO vest on the subject. The first HFCWO vest was then placed onto the subject. The HFCWO vest was turned on to the maximum frequency and intensity settings, and the subject was given five (5) minutes to acclimate before the spirometry measurements were repeated while the HFCWO vest remained on. The HFCWO vest was then turned off and removed, and the subject was given fifteen (15) minutes for recovery. An interim spirometry baseline was taken using the standard spirometry equipment and procedures, without any HFCWO vest on the subject. The second HFCWO vest was then placed onto the subject. The HFCWO vest was turned on to the maximum frequency and intensity settings, and the subject was given five (5) minutes to acclimate before the spirometry measurements were repeated while the HFCWO vest remained on. The HFCWO vest was then turned off and removed, and the subject was given fifteen (15) minutes for recovery. A final spirometry baseline was taken using the standard spirometry equipment and procedures, without any HFCWO vest on the subject. Lung function test results for the parameters TV, PEF, FVC, FEV1, and FEF25-75% were analyzed. A Student's t-test was performed at the 95% confidence level to determine statistically significant differences between the different compressor-based devices with regard to the change from baseline for each parameter. Data from each arm of the study was compared to the two other arms corresponding to the other two compressor-based devices as well as to the aggregate data set. A paired Student's t-test was used at the 95% confidence level to determine statistically significant differences between the baseline and during use parameter values for the mechanical oscillator-based group compared to baseline as well as for the aggregate compressor-based device group compared to baseline. A paired Student's t-test was used at the 95% confidence level to determine statistically significant differences between the during use parameter values for the mechanical oscillator group compared to the during use parameter values for the aggregate compressor-based device group. Thirty-two subjects were enrolled and two subjects withdrew. Two additional subjects were enrolled to replace the two subjects who withdrew. There were no statistically significant differences between any of the different compressor-based devices with regard to change from baseline for any of the tested spirometry parameters. It was concluded that data from the three compressor device arms could be pooled (the "Aggregate Compressor Device Group"). There were no statistically significant differences between any of the different mechanical oscillator-groups with regard to change from baseline for any of the tested spirometry parameters. It was concluded that data from the mechanical oscillator device could be pooled (the "Aggregate AffloVest Device Group"). There were no statistically significant differences found in TV or PEF from baseline for both the AffloVest group and compressor groups (Table 2). There was a statistically significant decline in FVC from baseline for the compressor group (4.12 L vs. 4.29 L, p=0.019) as well as in FEV1 (3.30 L vs. 3.51 L, p<0.005), and in FEF25-75% (3.19 L/s vs. 3.71 L/s, p<0.005). There was a statistically significant decline found in FEF25-75% from baseline for the AffloVest group (3.54 L/s vs. 3.71 L/s, p=0.031). 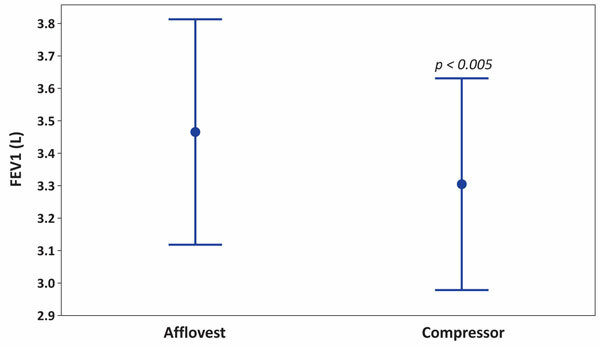 The results were further analyzed to determine whether there was any statistically significant difference between the AffloVest and compressor groups for each of the measured parameters (see columns "p-value AffloVest vs. Compressor) to analyze for significant differences between the groups. There was a statistically significant decline in FEV1 for the compressor group compared to the AffloVest group (Mean = 3.30 L, 95% confidence interval [2.96, 3.63 L] vs. 3.46 L, [3.11, 3.81 L], p<0.005), see Figure 1. In the compressor group, there was a 6.0% decline in FEV1 compared to baseline. In the AffloVest group, there was a 1.4% decline in FEV1 compared to baseline, see Figure 1. 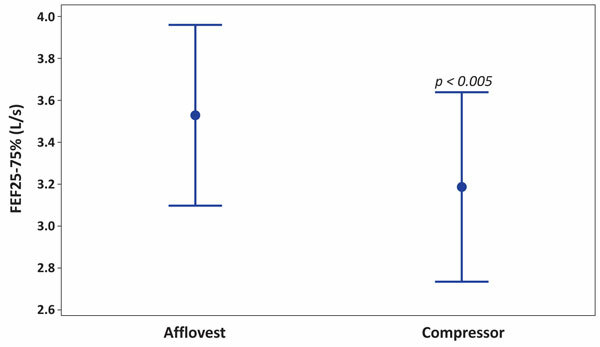 Figure 1 below shows the comparison of FEV1 between the AffloVest group and the compressor-based HFCWO groups. The means and 95% confidence intervals are shown. There was a statistically significant decline in FEF25-75% for the compressor group compared to the AffloVest group (Mean = 3.19 L/s, 95% confidence interval [2.75, 3.63 L/s] vs. 3.54 L/s, [3.11, 3.96 L/s], p<0.005), see Figure 2. In the compressor group, there was a 14.0% decline in FEF25-75% compared to baseline. In the AffloVest group, there was a 4.6% decline in FEF25-75% compared to baseline. Figure 2 below shows the comparison of FEF25-75% between the AffloVest group and the compressor-based HFCWO groups. The means and 95% confidence intervals are shown. Despite the widespread clinical use of the HFCWO devices, little has been published regarding the vests' effects while in use on standard spirometry measurements – TV, PEF, FVC, FEV1 and FEF25-75%. In this study, we report for the first time that compressor-based HFCWO vests while in use led to a significant decrease in FVC, FEV1 and FEF25-75% during use from baseline and that a less pronounced statistically significant decrease in FEF25-75% was observed with the AffloVest. There was no effect on TV or PEF. An earlier study with a compressor-based device in patients with cystic fibrosis found no significant effect on FEV1. However, in that study FEV1 measurements were taken before treatment with HFCWO vests and 30 minutes after treatment, with no FEV1 measurement taken during actual use of the HFCWO vest7. This suggests that the impact observed in this study to the spirometry measurements (FVC, FEV1, FEF25 – 75%) only occur during use of the HFCWO vests. It is not immediately apparent why FEV1 and FEF25-75% were decreased, while PEF was unaltered in our study. The mode of action of HFCWO vests is not fully understood at this time. The purpose of the device is to mobilize pulmonary secretions, which is done by creating oscillations of the chest wall. It has been reported that induced cephalad airflow bias results in increased mobilization of mucus8,9. It has also been speculated that increased cephalad airflow is the mode of action of HFCWO vests. However, the link between alterations in airflow and the mobilization of mucus has never been established through clinical studies in humans using HFCWO vests. Furthermore, airflow measurements which are taken at the subject's mouth, have not been correlated to any effects in the flexible airways, where cephalad airflow bias results in mucous mobilization10. Based on the concept of increased cephalad airflow bias in the lungs during use of HFCWO devices, one might expect that the expiratory peak flow should be increased. However, our study in healthy volunteers showed no increases in PEF in any of the HFCWO vest groups. On the contrary, we demonstrated a decrease in the expiratory airflow parameter FEF25-75%, suggesting that the concept of HFCWO vest-induced cephalad airflow bias is not supported by standard spirometry measurements. Warwick WJ, Hansen LG. The Long-Term Effect of High-Frequency Chest Compression Therapy on Pulmonary Complications of Cystic Fibrosis. Pediatric Pulmonology 1991;11:265–71. Chakravorty I, Chahal K, Austin G. A pilot study of the impact of high-frequency chest wall oscillation in chronic obstructive pulmonary disease patients with mucus hypersecretion. Int J Chron Obstruct Pulmon Dis 2011;6:693-9. Barto T, Daignault S, Stiglich J, et al. Registry Outcomes for HFCWO Vest Therapy in Adult Patients with Bronchiectasis. Am J Respir Crit Care Med 2016;193:A2307. Hansen LG, Warwick WJ, Hansen KL, et al. Mucus Transport Mechanisms in Relation to the Effect of High Frequency Chest Compression (HFCC) on Mucus Clearance. Pediatric Pulmonology 1994;17:113–8. Hardy KA, Anderson BD. Noninvasive clearance of airway secretions. Respir Care Clin N Am 1996;2:323-45. Culver BH, Graham BL, Coates AL, et al. Recommendations for a Standardized Pulmonary Function Report. An Official American Thoracic Society Technical Statement. Am J Respir Crit Care Med 2017;196:1463-72. Osman LP, Roughton M, Hodson ME, et al. Short-term comparative study of high frequency chest wall oscillation and European airway clearance techniques in patients with cystic fibrosis. Thorax 2010;65:196-200. Freitag L, Long WM, Kim CS, et al. Removal of excessive bronchial secretions by asymmetric high-frequency oscillations. J Appl Physiol 1989;67:614-9. King M, Zidulka A, Phillips DM, et al. Tracheal mucus clearance in high-frequency oscillation: effect of peak flow rate bias. Eur Respir J 1990;3:6-13. Fink JB. Forced expiratory technique, directed cough, and autogenic drainage. Respir Care 2007;52:1210-21.